Oklahoma State’s women’s track and field team signed Mary Davies to a National Letter of Intent, it was announced Tuesday. The Whangarei, New Zealand native will have three years of eligibility left after transferring from Auckland University of Technology. Davies, a former field hockey standout, has only been running in competition for two years and has already recorded impressive times in 3,000 and 5,000 meter races. Davies recorded a second place finish in the 3,000 meter run at the New Zealand Nationals with a time of 9:31. In the 5,000 meter run Davies recorded third place finish at the New Zealand National Championships with a time of 16:12.51. Davies has also raced in the 10,000 meter race with a time of 35:02 and the 1,500 meter race with a time of 4:30. Davies is best known as a cross country runner after finishing third in the New Zealand National Eight Kilometer Cross Country Championships and a 53rd place finish at the Senior Women’s World Cross Country Championships this past March in Brussels, Belgium. Davies will focus on the 3,000 and 5,000 meter races during the indoor track season and the 10,000 and 5,000 meter races during the outdoor season. STILLWATER, Okla. Freshman Mary Davies made the New Zealand national team and was selected to run at the World Cross Country Championships in Lyon, France the weekend of March 18-20. Davies finished fifth at the Big 12 Cross Country Championships and finished 48th at the NCAA Championships in November. The Oklahoma State University bachelor of education student was awarded a bronze medal in the 10,000-meter run at the World University Games which is New Zealand’s first on the track at a Summer Universiade to take the Kiwi tally to a record four medals. Waco, Texas Junior Mary Davies led Oklahoma State’s women’s track and field team Friday by claiming the conference title in the 10,000-meter run at the first day of the Big 12 Outdoor Track and Field Championships in Waco, Texas. After day one of the championships, OSU holds the second-place spot with 13 team points. Kansas State stands in first with 22 points, while Missouri, Nebraska and Kansas round out the top five in the team standings. Davies, who entered the race rated as the No.1 10k runner in the conference, proved her ranking by setting a Big 12 meet record in the time of 33:28.68 to give OSU 10 team points. Missouri’s Serena Ramsey (34:13.26) finished second, while Colorado’s Christine Bolf (34:47.26) finished third. Waco, Texas Oklahoma State’s Mary Davies set a conference meet record in the 3,000-meter Steeplechase Sunday at the Big 12 Outdoor Track and Field Championships, while claiming three individual titles over the weekend. After receiving 30 team points from Davies, OSU finished ninth overall for the championships. Defending national champion Texas captured its sixth championship with 131 points, while Texas A&M, Nebraska, Kansas State and Baylor rounded out the top five. For the second consecutive year the Cowgirls finished ahead of bedlam rival Oklahoma. Davies, a junior who claimed the 10,000-meter championship Friday, added individual titles in the 3,000-meter steeplechase and 5,000-meter run. Davies became the first athlete in the history of the conference to claim victories in the three long distance events at the meet. Davies was dominant in the events as she ran a stadium record time of 16:16.54 in the 5k and then set a conference meet record time of 10:09.42 in the 3,000-meter steeplechase. Davies, a junior from Whangarie, New Zealand won the award after capturing three conference titles (10,000-meter, 5,000-meter and 3,000-meter steeplechase) at last weekend’s Big 12 Outdoor Track and Field Championships. The talented distance runner became the first student-athlete in the history of the conference to claim victories in the three long distance events at the championships. Sacramento, California Oklahoma State’s women’s track and field team was led by the performance of junior All-American Mary Davies at the second day of the NCAA Outdoor Track and Field Championships, on Thursday. The Cowgirls and Stanford currently stand in a tie for fifth-place with six points in the team standings. Arizona State heads into the third day in first with 15 points, while Auburn (14 points), Duke (10 points) and Georgia (8 points) round out the top four. Davies, who has been the catalyst of the OSU team throughout the outdoor season, earned her second consecutive All-American honor in the 10,000-meter run after collecting the medal at last year’s championships. Davies ran a solid race as she finished third in a personal record time of 33:08.00. Arizona State’s Victoria Jackson captured the title in a time of 32:54.72, while Duke’s Clara Horwitz finished second in a time of 33:00.85. “(Mary) led for the majority of the second half of the race, which shows that her confidence is growing as a national class runner,” Sepulveda said. “Her speed is getting better and she has been patient with her training. Marathon rookie Mary Davies in her debut over the 42.2km distance finished eighth in the Vienna Marathon on Sunday. The Houston based runner from Whangarei recorded a time of 2h 42m 39s, just under the selection standard of 2h 43m for the world cup marathon in Berlin in August. Andrea Mayr from Austria won in 2h 30m 43s, from Ethiopians Derbe Godana Gebissa 2h 31m 31s and Hayato-Zeineba Hasso 2h 34m 1s. Gilbert Kipruto Kirwa from Kenya won the race in 2h 8m 21s. Northland runner Mary Davies' selection to represent New Zealand in the Marathon World Cup in Berlin in August sees her emerge as one of the country's top-rated marathon runners. A delighted Davies received the good news by phone on Sunday during at visit to her grandmother's home at One Tree Point. Along with Davies, Shireen Crumpton and Fiona Docherty - triathlete Bevan Docherty's sister - will also run at the Berlin event, while Michael Aish will represent New Zealand in the men's world championship marathon. Davies, who is based in the US, broke the qualifying standard in April in her first competitive marathon, when she finished eighth in the prestigious Vienna event, in 2h 42m 39s. She had planned to break the qualifying standard but as a rookie over the distance was uncertain. "The first one is hard because you don't know if your body can make it - you don't want to go out too fast because you want to have enough to finish," she said. Davies burst onto the local running scene seven years ago as a 19-year-old, shortly after coming under the guidance of coach Ian Babe. Just three months later she won gold in the New Zealand under-20 women's road championships and, in the same year, bronze in the senior women's race. In 2003, Davies was selected to represent New Zealand in the Ekiden Relays, in South Korea, and the World Cross Country Championships, in Belgium. And in the same year, she showed her potential over longer distances with a record-breaking win in the Kerikeri half marathon, in 1h 15m 19s - a record which still stands. In 2004, selected to compete in the World University Games in Turkey, Davies won bronze in a gruelling 10,000m, run in a scorching 43C. By August 2004, Davies had become well known as a runner with huge potential. 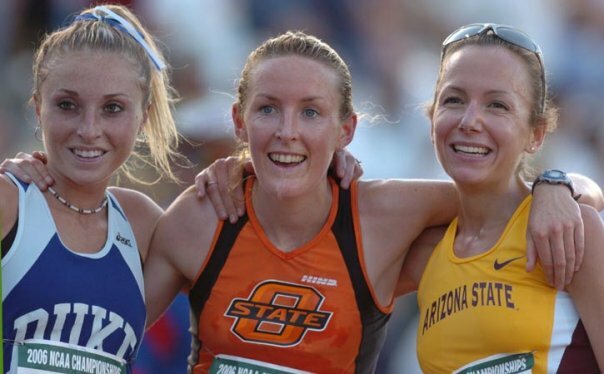 She was awarded an athletics' scholarship to Oklahoma State University, where she continued competing with considerable success in 5000m, steeplechase and cross country races. While completing her studies, Davies met Gabriel Sawakuchi, a young Brazilian studying towards a PhD. Since graduating, they have married and continued to live in Houston, where Sawakuchi is completing his post-doctorate research on proton therapies to combat cancer. Back in New Zealand for a few weeks, the pair intend to settle here in the future, but finding a suitable position for Sawakuchi may determine just when they return. Mary Davies leads the New Zealand team to eighth place in the marathon world cup. Mary Davies in only her second marathon knocked nearly four minutes off her inaugural time in leading New Zealand to eighth place in the marathon world cup at the World Athletic Championships in Berlin. Davies finished 35th in 2h 38m 48s, followed by Fiona Docherty in 41st in 2h 40m 18s and Shireen Crumpton 44th in 2h 41m 31s. Davies, from Whangarei but now based in Houston, was 44th at half way in 1h 17m 11s. Davies said that she still has a lot to learn on running marathons. "My strategy was to start out at 2h 40m pace, that I wanted to do. I think I started with the first group, maybe a bit too soon," said Davies. "I managed to stay with a group of the US runners for a while which helped, still I think I could have done a bit faster - but that's ok,"
The 26 year old who has a birthday in four days, said that coming from Houston she did not find it too hot. "It was good to run my first championships, the next time I want to place higher, I was hoping to do 2h 32m, so I was a bit disappointed. "I still have a lot to work through on the strategy," she added. 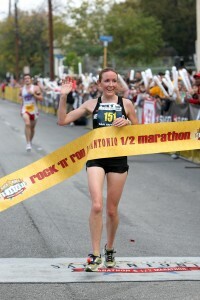 Sunday's Rock n' Roll San Antonio Marathon (and Half Marathon) was only the second ever, but the crowd was rockin' n' rollin' nonetheless. More than 31,000 runners and walkers, from all 50 states and 23 countries, registered to participate.Mary Davies won with half marathon with a time of 1:18:16.